The gang’s all here! I think for the first time in the comic so far. First, welcome new readers who found me through a snarky tweet that got some traction over the weekend. To be fair there is often fucked up stuff in this comic, but it’s usually crab related. The 2018 Hugo Award Nominations are open! If you enjoyed my work in the previous year, I would be extremely grateful if you’d consider nominating “Mare Internum: Chapter 4” in the Best Graphic Story category (due to the voting process, only complete segments- such as a chapter- of a work are eligible for nomination. Next year the complete work will be eligible). Also, I absolutely found this comic through your snarky tweet and I’ve spent the last two days furiously reading through this. I’m usually not one for webcomics (or comics in general), sci-fi or mysterious fungi crowns permanently affixed to skulls, but this has completely captured me. You have made all the characters so empathetic in a way that I’m rooting for all of them. It’s masterful art, storytelling, character building and atmosphere. I’m in awe of your work as an artist, both in medium and story telling. I’ve read through a few of the comments (mostly not because I was too excited to get to the next page) but the devotion (ha!) with which people have given this world you’ve built is amazing. And your interaction with everyone is so lovely to see. I’ve always been in awe of creators who give this kind of level of work to people, for free; and it makes me happy that people are giving you so much love in return in terms of comments, support, queries and theories and their own interpretations. Your characters may be my favourite part–how well rounded, realized and real they are. Mike and his struggle, his back and forth on survival and giving in, his deadpan humour and reluctant compassion, how the trauma of his childhood trickles down. I could be wrong in this interpretation, but I love the parallels between Kalla’s own resignation with her part of the world and Mike’s spiral and how he clawed his way back up; how Mare Internum acts as this allegory or metaphor for depression–how the characters are caught between despondency, thinking they will never get out, and then they find a surge of courage to try again. Might not have been your intention but I’m struggling with my own depression and anxiety and it’s been strangely inspiring? How easy it is to just give in to what is laid before us but, in big and small ways, how they continue to push back. I know you said before this is singular story about a specific person and not a full display of all the different ways a person can deal with their trauma and mental illness, but it’s beautifully universal, too, I think. That lots of your readers I’m sure have found themselves in a similar situation–whether it’s depression or anxiety or hopelessness or fear–and it’s treated in a way that doesn’t glorify or romanticize it, but neither does it back down from the harsh reality. But there is something like an undercurrent of hope running through it, giving the characters that extra little nudge to take another step. As we learn more about Mike, his distrust and paranoia and harsh reactions to Bex in the beginning make more sense; I can see how it would be hard to trust anyone when he feels like every person who has got close to him has used him in some way. The loss of Kalla is so much harder in hindsight because of that. Bless you for bringing her back! Bex and her strong will, her steadfast determination, her refusal to let people see her be weak, the times when she can’t hold it in any longer. I know a lot of people have commented on her character, negative and not, and I just want to let you know I absolutely adore her. You’ve taken what could have been a truly abrasive character and have given her depth, courage, truth, hardship and this soft, compassionate core; she is not some ruthless, conniving monster, but someone who struggles just as much as anyone, living with her successes and failures. Her story about choosing between her family and her life–gosh, I feel that so hard. As a mom myself, the moment when she confessed to her husband, “Where do I go?” outside the nursery store. Dude, DUDE. It’s a thought that runs through my mind at least once a day–where do I go from here? Thank you for writing that story honestly and not making her a villain or a martyr, just a real person struggling with a sense of self and fumbling along the way. For me, I believe she wants to get back to her kids, that she was telling the truth to the processor. But only time will tell and whatever may come, I will root for her. Kalla and all her wisdom, her sensibility and unintentional humour (though I think she knows she’s got some kind of wit about her). Levi! Thrip! Threvi?! Honest and inquisitive and precious. He is so like a child, it’s true, in all the ways that he is forthcoming and endlessly asking questions (so. many. questions.) and just bubbly. It’s a marvelous cast a characters, a bunch of misfits, and yet they are harmonious together, even with their conflicts and disagreements. It’s not easy but when is it ever? Especially struggling to survive in some strange cavernous alien world where apparently some globby omniscient overseer spies on you through water. Very yikes. Thank you for creating multi-life cycle reincarnations and glowy water that brought Kalla back to us again or else I would have been utterly bereft. Thanks for giving Mike a constant buddy in Thighfriend–the real MVP. Thanks for creating a sci-fi world that’s accessible to people like me, who say “I don’t really like sci-fi” (maybe it’s time to admit that I probably do). If I haven’t understood a concept, I’ve usually found an answer in the comments from you (or the glossary) or some savvy reader who knows so much more. Thank you for your dedication and effort and sharing your world, your art and your story with us. It always takes courage, no matter what stage you’re at in pursuing your dreams. You’ve created something wonderful that has resonated with so many people. You’ve spurred discussions and created little followings and made us cheer and cry and sigh in relief. I always love finding something like that, that makes you need to come back to see how it all ends, not just because you’re curious but because you want to see what will happen to the characters next, if they will overcome and succeed and find their way back home, wherever it may be. Because you care for them, as a reader, and are invested in a way that’s entirely emotional. Anyway, apologies for the rambling mess and any mistakes in this but I just needed to dump out all my excitement and love for this in one go. I am eagerly awaiting the next chapter! I had to wait a while to respond, haha, your comment kinda made me tear up a bit. Just thank you very much for all your thoughts and perceptions, a lot of my work I have to make because I feel like I’m not able to articulate myself, or get my point across in any other ways, and it’s very affirming to know that someone understands where I’m coming from and what I’m trying to do. Thank you so much for giving my work a try, and I’m glad that you like it! Sci-fi is a huge genre that has been up until recently dominated by certain types of writers, and I find it is a lot easier nowadays to connect with work that speaks to me thanks to the diversity of people who are sharing their thoughts on the internet. Definitely check out my links section, if you’d like, for more cool comics by other indie creators. I have to say I’m impressed that you picked up all the lingo and nicknames from the comments as well! THIS! t h i s . THIS!!! I’m usually sort of a lurker and don’t comment much, but I agree so much with kim here. This comic is such a moving story with such character depth. I have been following since the beginning (since the concept sketches on tumblr stage!) and absolutely love how the story has developed and made me both feel and think. As the comic begins to draw to a close, I just want to express my appreciation. Thank you, Der-shing! what are those bat things flying into Micheal and Kalla’s eyes? Annoying, blue winged creatures swarming people in a cave? 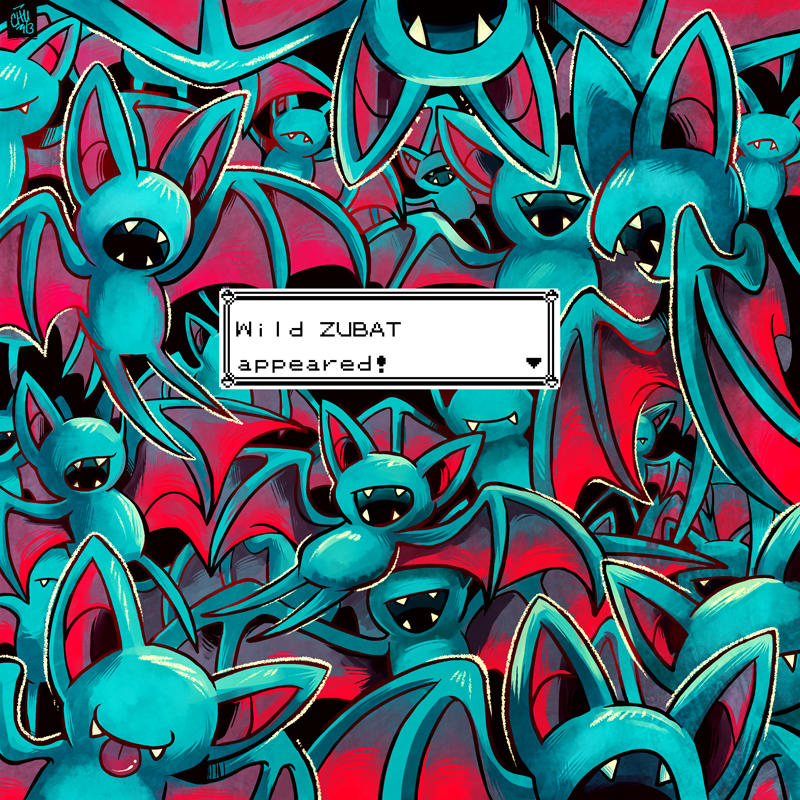 It’s gotta be Zubats, right? Judging by everyone’s reaction, I think they’re called Whatevers. Aaaw, look at how Mike’s holding Levi in the last panel…! I hold this mild fear that they have repeated these same actions over and over again and the processor has simply recreated their bodies and put them back where they started each time so that many years have passed since Mike and Bex actually fell in here. I loved Rendezvous with Rama, as well as its sequel. The third book got too political for me, and I never read the fourth. I think what I was most attracted to was the discovery and exploration of something completely new to human experience. Help me out, when did Michael learn that Thrip is Levi? Or can he understand him now? That would also be a change. Probably learned from the Processor. I wonder why he didn’t try to go back to Kalla after meeting Processor? Probably was waiting for Bex to come? Wow, I totally did not get from that that Mike knew Kalla had been rebooted. After all, he saw that Bex had cut off Kalla’s head [*shudder*], so he didn’t need the processor to tell him that. Hm, I can see that… I thought the “killing everything you touch” might imply he knew about the rest of what she’d been up to, but I can see how it might be read as just that one scene. I’ll add that to my list of things to touch up. Honestly shing, I’d leave it? It’s a bit ambiguous, but then that’s how real communication works. i liked that it hinted that Micheal /knew/ what Bex had done, without actually revealing that he really did know what Bex had done. are they… purposely aiming for the eyes ? I like how Michael essentially has a crown. He is King of the fungi! ALL HAIL THE MYCELIAL MONARCH! ALL HAIL REGENT THIGHFRIEND! I love the pafbats and the noise they make. But which is it? – we have seen one other talking “thing”… the creature that made contact with Bex at the cost of it’s existance, which it seemed surprisingly OK with, like you would expect of a drone… but was it just a well integrated Martian that was cool with losing a life that was fairly recently backed up? If he didn’t count before his reincarnation, (which he may or may not have done… it depends on how advanced AI normally is in the Internum-verse) it has been strongly implied that he is much more than a survey-bot with a convincing personality emulator now that he has been “upgraded”. 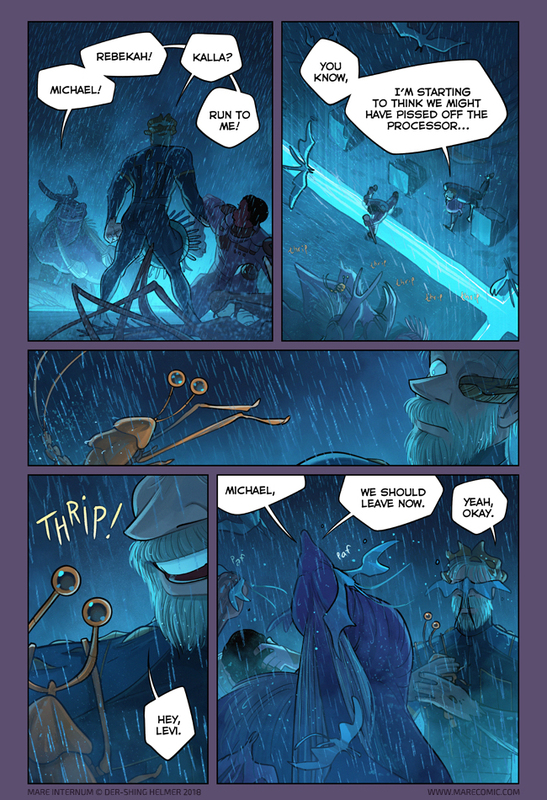 Mike in that last panel is surrealist. On the one hand: yay all the characters are together now. On the other hand: this means something bad is gonna happen. Gonna. Yet another bad thing on top of the pafbats, you mean. Joke while you still can, Der-Shing is going to break our hearts!! There’s a critical mass of beloved characters here. Joke is not quite the right word . . . whatever happens next, and after that, the ending is gonna leave me, at least, heart altered . . . broken and put together differently? That’s why Der-Shing is up there with the greats. who remembers the sudden reunion scene in “Rocky Horror” where they do the roll call? I love all of Kalla’s different hairdos. She seems to change it up pretty much every time she’s offscreen. She is the undying last of her kind trapped in a bunker by sentient rain and she is READY FOR HER CLOSE-UP. YESSSSSSS!!! This has me so hyped! GET ‘EM KALLA!! Oh wow, I wondered why I wasn’t seeing any new pages! I wasn’t getting the emails for some reason until today so I missed this and the next page or two? Well, thats ok I get to read more than one at a time then! its weird I didn’t get an email though. hmmm, off to read!